I recently returned from a 10 day vacation to Alaska and Canada. While I was away relaxing and having a great time communing with glaciers, Tropical Storm Debby passed across the state of Florida with high winds and torrential rains. Tampa Bay was hit particularly hard. When we returned home, we were greeted by grass that seemed about a foot high and a property that was quite a mess! Thankfully, the house was fine, but there was a lot of cleanup to do with tree limbs, branches, and Spanish moss littered all over our 2 acre property. After giving myself a full day to recuperate from the long flight and slight jet lag, I set to work in the yard with the rest of the family to clean up the debris and load it into the firepit. It wasn’t long before my efforts were noticed by several enormous wasps hidden behind a clump of Spanish moss hanging off a cypress tree down at the lakefront. I must have inadvertently disturbed their nest and they were not happy campers. Now, I’m not particularly afraid of wasp stings. I’ve been stung a zillion times and never found the experience to be particularly painful or problematic. 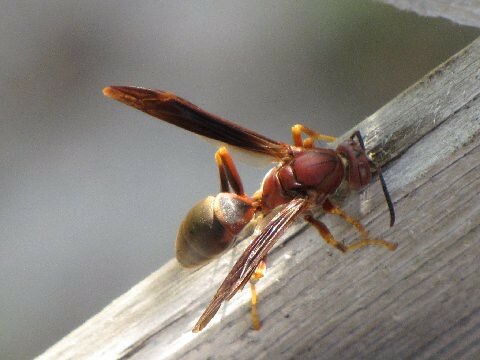 Once I was even stung multiple times on a spot about the size of a quarter on my forearm and barely flinched. This time, though, was different. A big wasp managed to sting me right through my sweat pants on my upper left thigh and it felt like someone had stuck me with a needle. Instead of ignoring it and going about my business which is my usual course of action, I went into the house to take a look as the pain was unusually sharp. Sure enough, a big red spot appeared on my thigh and a patch of red started to grow and swell around it getting ever bigger with the passing minutes. The pain didn’t die down either, so I dabbed some tea tree oil on the spot and this eliminated the discomfort within a minute or so. The red spot continued to grow, however, and I became concerned that I was perhaps having some sort of an allergic reaction to the wasp sting. At that point, it occurred to me that I might be lower in vitamin D than usual given that I had gotten little to no sun recently while in the far reaches of North America. I also did not take my usual dose of cod liver oil while on vacation. I only took 3 capsules a day as carrying the liquid in a travel bag was not as convenient. 3 capsules only equates to about one-third of my usual daily dose when I take it straight off the spoon. Low vitamin D levels have been associated with allergic reactions of all kinds. So, I decided to take a spoon of high vitamin cod liver oil right then and there. I took 2 full tsp which is approximately 6000 IU of Vitamin D bound together in a whole foods based, synergistic package with the other fat soluble vitamins A, E, and Vitamin K2 along with unadulterated omega 3 fatty acids. Before you race off to the healthfood store to buy cod liver oil, however, be advised that nearly every single cod liver oil brand on the market contains little Vitamin D and of the ones that do have a decent dose of D, it is usually synthetic – added after the violent processing destroys the natural version! Vitamin D taken as raw cod liver oil, completely unheated and gently purified, is much more effective than taking it in isolation as our bodies are designed to take in nutrients as food, not pills or drops. Taking nutrients in isolation can cause imbalances and should be avoided unless under the care of a physician who is using them therapeutically for short periods of time to correct a severe deficiency. Within a few minutes of taking a spoon of high vitamin cod liver oil, the red patch that was growing on my thigh stopped. Within an hour, it began to recede and continued to shrink until it was nothing but a small spot the next morning. I’m not the only one who has had success treating insect stings with cod liver oil. One gal I know swears by it when she gets a red ant bite which typically triggers an allergic reaction. She has discovered that a big dose of high vitamin cod liver oil stops the reaction from the red ant bite from progressing. The next step, of course, it to get rid of the red ants so this problem doesn’t happen again! Others have reported to me over the years that cod liver oil is helpful for allergic reactions to bee stings, ant bites, and even horse fly or mosquito bites which cause significant swelling for some people. Of course, cod liver oil does not take the place of an epipen. If you have a life threatening allergic reactions to insect bites, make sure you continue with the proper medication if the situation warrants. But, if you experience non-life threatening allergic reactions to insect bites or stings like I did and want to stop it in its tracks, try high vitamin cod liver oil. With its easily absorbed, whole foods based dose of fat soluble vitamins, it will also help prevent Vitamin D deficiency symptoms.